Evergreen content is content that stays relevant and useful year after year. Similar to an evergreen tree that thrives and remains healthy year round, this specific type of content is constantly valuable even long after it was published. The best part of all is that there is little to no need for updating by the part of the author. Evergreen content is comprised of information that people will refer back to over and over again. Think of websites like Wikipedia and IMDb. These are huge websites that have built audiences by posting evergreen content that remains relevant. They do have to go back occasionally and update information as it comes up, but for the most part, it remains timeless. Why is evergreen content so valuable to writers and website owners? There are many benefits to optimizing these types of articles. We’ve identified 3 key reasons why. It does take some skill to write a great piece of content in order for it to remain evergreen. It takes a skilled writer, or at least a writer writing from a unique perspective, in order to put together a piece of content that is high quality. Its focus will be very specific and optimized well for targeted keywords. This piece of content will become an authority for a given topic and will perform well in search engines. Over time, content that keeps a consistent flow of traffic is valued by search engines as continually relevant. Visitors that keep coming back to reference a piece of content indicate that the content is, in fact, valuable. Therefore, search engines will tend to bump the piece higher in their rankings which will in turn, increase traffic. Due to the success of the first two points, consistent traffic will continue to generate leads for your email list and blog subscribers. You’ll find that quality pieces of content that remain relevant year after year will include a large portion of leads for your business. If you’ve already written content that has continued to perform well over time, be sure to check out our article on our 8 Strategies For Repurposing Old Content, here! If your style is more about posting breaking industry news, you may find an immediate uptick in visitors due to the timely nature of the post, but it probably won’t sustain year after year. You’ll find that those old pieces of content will be irrelevant much sooner than you think. So, with that, we’ve comprised a list of 3 awesome tips on how to make your content stand the test of time. There are essentially two different types of content that are considered evergreen: Timeless and Sustainable. These types of evergreen content require very little upkeep even as industries and times change. Articles that describe “How-To Tie Your Shoes” or “How-To Ride a Bike” will remain relevant no matter what happens in the shoe industry or bicycle industry (At least anytime soon). Similarly, content such as: reports on relevant historical events such as an etymology piece, a language translation guide or phrasebook, or even dancing during the Roaring Twenties may all remain timeless. Sustainable: Content that has a strong potential to remain relevant with time, yet, due to industry changes and trends, the content may lose value unless it is maintained and updated for these changes. Both of these topics are wonderful resources and have potential to remain so for months on end with no need to update. However, as the social media channels update their user interface and the year changes come January 1st, you’ll need to go back and update your content in order to remain relevant. Though the information can go out of date, the content remains evergreen as long as it’s constantly updated to reflect changes in technology and culture. It’s no secret that most small businesses don’t have huge marketing budgets. A lot of small business owners or start up companies turn to social media channels in order to gain followers and advertise products and services for free. By establishing yourself on social media channels, you are not only able to better engage with your audience, but you have the opportunity to show them the human side of the brand. A well written evergreen article can not only be effective to your customers reading it today, but it can be a relevant post months or even years down the road. By re-sharing on social, you are able to continually connect with your audience even when you don’t have anything new to share. For more strategies on sharing your awesome content, check out our 7 Best Content Strategies For Any Size Blog, here! If you aren’t currently using any of these elements on your blog or website, we highly encourage that you do! Quality evergreen content will help drive the right traffic to your blog/website over the long term. You can display this information in videos, images, infographics and even podcasts. Don’t feel like you need to stay confined to writing articles. Evergreen content will remain a staple to your company’s content for years to come. For even more out-of-the-box content strategies, check out our complete list of 50 Brilliant Blog Post Ideas for Your Next Article here! Also, check out our 8 Strategies For Repurposing Old Content, here, and our 7 Best Content Marketing Strategies for Any Size Blog, here! Which of these strategies do you hope to include in your content creation plan? Do you have any that you’ve seen work well for you and your blog or website? We’d love to hear about them in the comments section below! 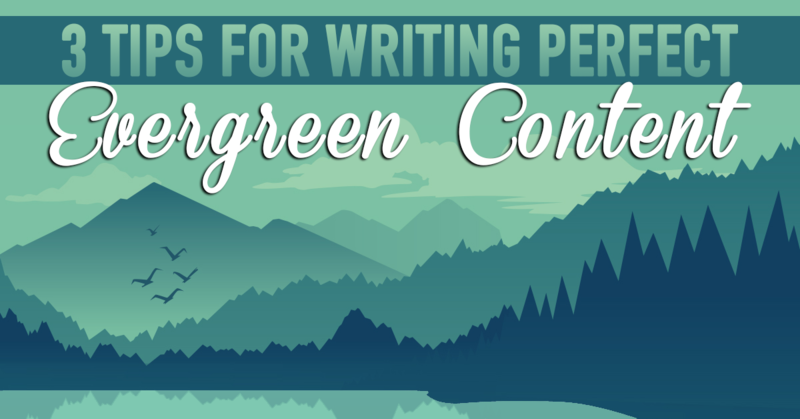 These tips are great strategies to implement when creating evergreen content. Remember to continue to update articles when necessary in order to reflect new information. With these strategies in place, your content will continue to be established as fresh and timeless for all readers. Great article, it gives a great understanding of evergreen content. At the moment i am working on including video tutorials, but it’s a time-consumer.